Since I’ve gotten a bit busy and I’m not sure I can double up on posts, I figured I’d extend my horror theme into November. I’m usually consistent with my schedule (for this blog… my review blog is just barely out of hiatus.) That said, I don’t feel up to creating at the moment. I’m attending two memorial services for separate family members. I’m understandably quite distraught over the situation. I need enough time to recuperate and I’ll be back in action. Thank you for understanding. With that, my next post will likely be late. For some, the antipaladin and the oathbreaker represents a fall from grace. These are the exiles and the heretics whom must be stopped at all costs! But, what happens when an entire oath is distorted by gradual influence of the darkness itself? The Order of the Blasphemer is one such atrocity that arises. These distorted paladins have lost their way much like the blackguard, but are convinced they serve a divine or holy cause. This could be from sheer madness or from a dark revelation that the order itself is corrupt. While many devotees of dark forces are aware of how far from grace they have fallen, the blasphemer order is tragic and ironic in their ignorance. Driven mad by their past oaths and ideals, they have become delusional in the corruption they carry. Many mad blasphemers have reached a level of insanity typical in the most devout of abyssal followers as a result of their broken minds doing all they can to refute their wretched existence. Those who manage to break free of their mania typically become oathbreakers. Some try to atone and become cynics. The rest die from despair or failure to absolve themselves of their sins. Author’s Note: Ah, deconstructing the Paladin… it’s always fun! As written above, I’ve done this before with the Cynic. 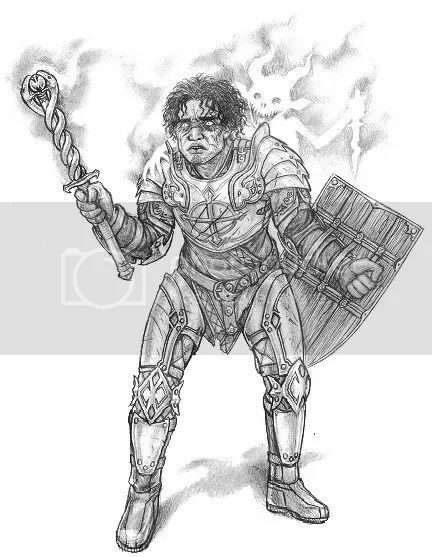 Here, I have a new twist on the antipaladin/blackguard, a reluctant one who clings onto their old hopes and views while unwittingly (or perhaps willingly) committing great evil. Also, take note! This concept was an experimental idea I came up with to expand the oathbreaker archetype. Some of the ideas are volatile and will be patched up in the weeks following. Also, the original idea was far closer to Artorias from Dark Souls, but I figured it would have been too much of an homage. But enough from me, subscribe today and a faustian bargain can be yours!